Alchemical Hypnosis is a new form of hypnosis therapy based upon the blending of transpersonal and Jungian psychology and elements from shamanism, utilized whilst the client is in an ‘alert’ trance. The essence of Alchemy is a daily practice of using our inner guides to heal ourselves and to help us to live an authentic life. The subconscious mind controls our emotions, our self-esteem, our beliefs, our immune systems, and our bodies. With hypnosis, we come to understand what the underlying causes of our problems are. Then we can then transform them, using this daily spiritual practice. 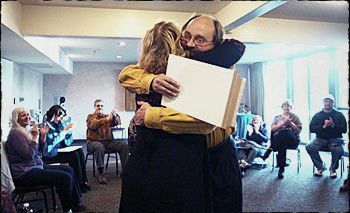 I did the full training in February 2009, with the creator of the process, David Quigley, at the Alchemy Institute of Hypnosis in Santa Rosa, California. Emotional clearing involves exploring our childhood or later experiences of trauma and neglect and the transformation of these memories into positive resources of security happiness, peace and love. The Alchemical Hypnosis training program is very intense. I had to deal with my own issues every day and clear them. It’s amazing how my inner child held onto emotions, and up they swell if the reason they came about is not dealt with! We looked at how necessary parental nurturing and security are. If the inner child’s needs are met then the adult is balanced and well adjusted. The special bond that I had with the class members made the experience so powerful to us all. I discovered that I was a sister to one and a mother to another in past lives and that we belonged to the same soul group. When our soul (higher self) incarnates it blends with our ego (lower self). However when our basic needs as children aren't met we become trapped in a survival mode and their feelings are suppressed. As children we don’t always understand that our basic needs consist of love, affection, freedom, play, food and companionship. Not being nurturing as an infant sometimes results in an adult who gives too much, in order to gain love and approval. This process is not about blaming our parents but meeting the basic needs of the child inside of us. Through emotional clearing we find a new loving inner mother who can take care of your needs on a daily basis. You may think that being neglected by your busy parents is insignificant, but for a child this repeated experience is devastating. The child may decide “if only I were perfect I could get attention.” As the person struggles to achieve a perfect body this manifests into an eating disorder. Once we regress the client to this memory it is not sufficient to simply view the experience. We must transform the memories and provide new memories of love, nurturing and guidance, perhaps from new loving parents in the inner world because Alchemy is primarily a self-healing process. This restores the client to appropriate adult responses to the stresses and challenges of the outer world. The client can release their need for a perfect body and their eating disorder disappears. In order to be successful after a session the client is trained to continue interacting with their guides on a daily basis. Emotional clearing, my process: The biggest change for me, was feeling love inside me. As a child, I had a series of let downs from male figures. So my relationships with men have always been a disaster and I’ve always been a ‘pleaser’. Through emotional clearing, and working with my inner father, I gave my inner child the nurturing she didn’t get. It was blissful to feel unconditional love pour into me from my inner parents and this has really changed me, as I’m no longer a pleaser. We need to understand however, that our parents may also be wounded children. We may have a karmic relationship with them from past lives. Through our soul’s development we can break the cycle of pain we cause each other. Since graduating I’ve done a session with a girl who was abused as a child. Her inner child had never spoken to her because she was so scared and mistrusted the client. I started by asking the inner child to write a note and then we developed trust in the inner child as the client listened to her needs. It was amazing to see the change in the client: afterwards her communication skills with her partner improved dramatically. In the next segment of the training I examined my relationships with my parents and saw the karmic lessons I needed to learn. It may not be only experiences in this life that need to be cleared but those from past-lives. Many of the relationships we have in this life are not by chance. We incarnate with other souls to learn specific life lessons. We may have experienced trauma in past lives and that past life personality may need to be rescued. However, we may also have karmic debts to pay by having caused trauma to other people, in our past lives. Our soul needs to atone for what we did and ask forgiveness from those who were affected. Understanding how past-lives affect us helps us to gain insight into fulfilling our soul’s purpose in this lifetime. Past life regression for physical healing: In my training my fellow student Mary Cajun volunteered for a session with David Quigley. Mary had a hip replacement four months before coming to the training, and still found it difficult to walk. When she was taken into trance, she was asked to go 'to the memory the hip was holding, what the hip wanted to tell her'. David demonstrated Alchemical Bodywork techniques, by using both of his hands under her hip, to gently vibrate it. He explained this is a method used to assist in discovering the memory. Mary soon saw herself as a Viking who had just come back from a successful raid. He was tall, strong and proud and as he walked to shore he slipped on a rock. He broke his leg badly. This event brought great shame on him, he was no longer honored and his life fell into misery and he died. David then asked this Viking to examine this life and see that he had brought identical shame to all the victims of his murder and pillaging. All of the souls of people who had been wronged were brought in front of him and he pleaded in tears for forgiveness. The powerfulness of that moment struck me, as he was forgiven because he finally understood their shame as a result of his accident. The group then channeled healing energy to Mary’s hip to help with the healing. When she came out of trance and walked around the room her walk was noticeably better. She has continued to improve. One of the prime elements of Alchemy is dealing with the many voices we have, which may be conflicting. The aim of conference room is to unite these voices. Conference room first involves giving the character an opportunity to voice their concerns. For example most of us can identify the judgmental voice within us that is always criticizing us and making us wrong. The aim of conference room is first to hear out the judge's complaints. Then we need to turn around that judgmental way of thinking by making the judge realize that this approach clearly isn't working. We need to convince the judge to take a more compassionate and supportive approach. There are many other inner voices within the conference room that also need to be addressed. A fellow student named Jeronimo had joined the course after being diagnosed with lymphatic cancer. After completing emotional clearing sessions Jeronimo had uncovered that he was not following his life's path that he was supposed to become a hypnotherapist. Yet he still had doubts about working as a hypnotherapist because he had been working as a carpenter for many years. I took Jeronimo into a hypnotic trance and guided him on a journey to meet with his future self. Jeronimo met his future self on top of a mountain. His future self reassured him everything would be fine with his professional practice as a hypnotherapist. I noticed an expression of doubt on Jeronimo's face so I asked '"is there anyone in your inner world that has an objection to you becoming a hypnotherapist?' His mother appeared saying “you're a father. You need to provide for your family”. So I asked mother “who brought you here to speak with us?” it was the cynic, the cynical part of us who is concerned about money and survival. Family members may appear during a conference room session who have been in brought in by one of the client’s sub-personalities. So I explained to the cynic and Jeronimo's mother that there weren't any other Spanish-speaking hypnotherapists in his area. With such a large Mexican community here Jeronimo could easily build a practice. The cynic said “But they're Catholic. They won't accept this kind of therapy”. Jeronimo's adult self interjected adamantly “Well I was brought up Catholic. Not everyone will agree with this, but there are people who will try it." The cynic agreed with us. Then another voice butted in “He's a carpenter, he's not educated.” We quickly identified him as Jeronimo's inner judge. So I replied “Well, your Honor, since Jeronimo started the training he has successfully completed hypnotherapy sessions on his fellow students". The judge still not convinced, said “he isn't bright enough to be a therapist” Jeronimo replied that he hadn't felt fulfilled as a carpenter and when doing this work he felt alive. I said, “your Honor, Jeronimo has used this work to heal himself of cancer. And his fellow students and assistants have all applauded his abilities. This is living proof that Jeronimo is competent.” The judge conceded that Jeronimo's health had indeed improved and that fellow students were impressed with his abilities. So then I persuaded the cynic and the judge to unite and work together to help Jeronimo to set up a practice. The day I flew back to the UK I had breakfast with Jeronimo. He told me he had just been the hospital for a cancer scan. "It came back clear!" he said beaming. Jeronimo is now working hard to bring hypnotherapy to the Latin community where he lives. Somatic healing is one of the most exciting developments in Alchemical Hypnosis and involves harnessing energy from your guides and letting them work through you to heal illness and injury. These processes include hypnotic movement, meeting an inner healer who provides consultations and spiritual surgery, and color healing. I learned that this can be done on its own or in combination with emotional clearing. Here’s the experience of a fellow student Anita Lohne, a well-known healer in Norway. Somatic Healing can be a transformational experience that allows you to really let go of deep feelings that your body has been holding onto. During this practice session in the training we worked in groups. And the combined energy of two or more therapists working on you at the same time increases the healing and makes it possible to you let go on a deeper level. Anita’s experience was transformational. For the first time in her life she was able to let go of all the old pain in her neck caused by a motor accident years before. During the practice session, three therapists were working on her at the same time, one was doing hypnotic movements with her neck, one was working on her stomach area and the third one was channeling energy into her head. Anita reported having never been so deeply relaxed and feeling like the little baby in the womb who was nurtured, loved and supported for the first time in her life. Since that day, she has been free of pain in her neck. Since the training I have done a lot of Somatic Healing on my own clients with fantastic results. This healing modality works like a melting pot that releases trapped emotions and merges new, happy feelings deeply into the body where the healing needs to take place. Summary: I had discovered for myself that Alchemical Hypnosis training went deeper than other hypnotherapies because in class and in session you not only uncover the underlying causes, you transform them. I witnessed all the students at the training experiencing a profound personal experience of transformation and healing. It was my privilege and pleasure to participate.